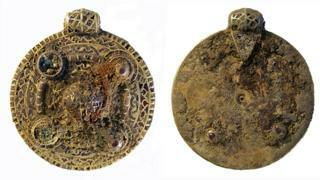 Anglo-Saxon jewellery, discovered by a metal-detecting history student in 2014, has been valued at £145,000. Tom Lucking found the items, including a 7cm (2.8in) pendant, in the grave of a female at Winfarthing near Diss. In November 2016, an inquest in Norwich declared the haul, which included coins and a copper bowl, to be treasure. Mr Lucking, who was 23 when he found the items, said at the time: "We knew there was something large, but couldn't predict it would be like that." The former student from Felixstowe, who is now an archaeologist, said any money he receives will be used for a deposit on a house. "It's going to make things a lot easier," he said. The find has been valued by the government's Portable Antiquities Scheme, based at the British Museum in London. The owner of the land and Mr Lucking's metal-detecting partner will also get a share. One of the largest pendants, made of gold and inlaid with hundreds of tiny garnets, pictured top, was valued at £140,000. Coins in the grave have suggested the skeleton and jewellery date from circa 630-650AD. Much of the jewellery was still on the skeleton, who would have been of extremely high status socially, and one of the earliest Anglo-Saxon converts to Christianity. Norwich Castle Museum is understood to be interested in buying the pendant.